Agrobacterium radiobacter DSM 30147T (= ATCC 19358T) was first isolated from saprobic soil in 1902 as Bacillus radiobacter  and obtained its current name until Agrobacterium genus established by Conn in 1942 . Based on phytopathogenic properties, Conn divided Agrobacterium into 3 species, A. radiobacter, A. tumefaciens and A. rhizogenes . 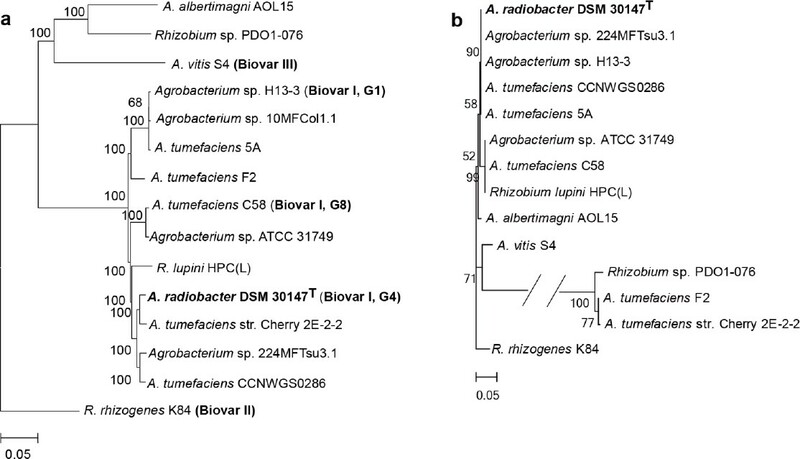 Subsequently, A. rubi, A. vitis and A. larrymoorei were also identified within the Agrobacterium genus [3–6]. Recently, A. rhizogenes was transferred to Rhizobium genus, as Rhizobium rhizogenes, based on multilocus sequence analysis (MLSA) using several housekeeping genes (rrs, atpD and recA) [7,8]. In addition, Young et al. proposed that A. radiobacter should have priority over A. tumefaciens, and A. tumefaciens may not officially represent a species [8,9]. Thus, currently, the genus Agrobacterium contains four validly named species, A. radiobacter, A. vitis, A. rubi and A. larrymoorei [7–9]. Most strains in the genus Agrobacterium are phytopathogens and induce crown gall tumors or hairy root diseases in their host plants . However, A. radiobacter is an exception because it does not have the tumor-inducing (Ti) plasmid that contributes to the pathogenicity [13–16]. A. radiobacter members have been widely found in soil, in the rhizosphere of plants and in clinical specimens . A strain of A. radiobacter was reported to enhance soil arsenic phytoremediation, indicating a potential application in bioremediation . However, some members have been identified as opportunistic human pathogens . So far, a total of 11 Agrobacterium genomes (3 finished and 8 draft genomes, listed in Table 1) have been sequenced but no genome of A. radiobacter has been reported. Considering its essential biological feature and important phylogenetic position in the genus Agrobacterium, we present the genome sequence of A. radiobacter DSM 30147T, the first sequenced strain in this species. Strain DSM 30147T is rod-shaped (0.6–0.8 × 1.5–1.8 µm) (Figure 2). The enzyme activities and carbon sources utilization of strain DSM 30147T were tested using API ZYM, API 20 NE and API ID 32 GN systems and the results are shown in Table 2 and in the emended description of A. radiobacter. A transmission micrograph of A. radiobacter DSM 30147T, using 200 kV transmission electron microscopy FEI Tecnai G2 20 TWIN (USA). The scale bar represents 1 µm. The whole genome of A. radiobacter DSM 30147T is 7,122,065 bp in length, with an average GC content of 59.9%, and distributed in 612 contigs. 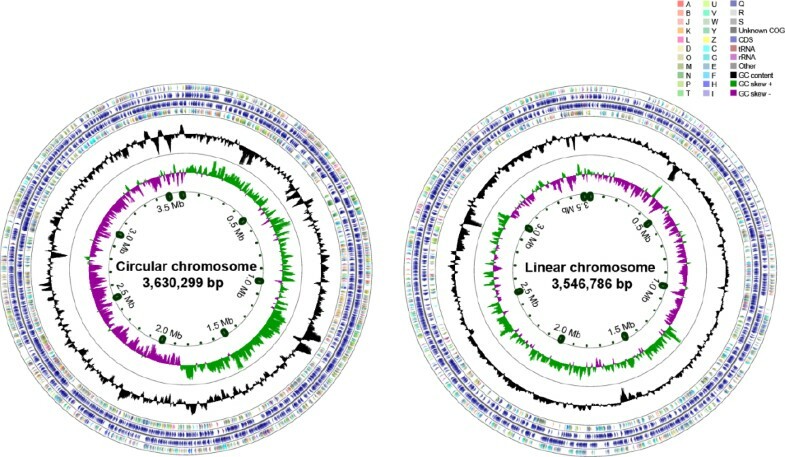 Compared to the complete reference genome A. tumefaciens C58  (also belonging to Biovar I, Figure 1), the whole genome of strain DSM 30147T could clearly be divided into 2 replicons, a circular chromosome and a linear chromosome (Figure 3). In accordance with its non-phytopathogenicity phenotype, strain DSM 30147T did not contain a Ti plasmid. Of the 6,894 genes predicted, 6,853 were protein-coding genes (CDSs), and 41 RNA genes. A total of 5,320 CDSs (77.85%) were assigned with putative functions, and the remaining proteins were annotated as the hypothetical proteins. The genome properties and statistics are summarized in Table 4 and Figure 3. The distribution of the genes into COG functional categories is shown in Table 5.